Some details about Intel's additional 8th Gen and the future 9th Gen processors already leaked out earlier today but now there's a more comprehensive article over at AnandTech with a lot more details. The new 8th Gen Core processors are expected in the first half of 2018 and it will include various six-core, twelve-threaded processors for the laptop market. The chip giant will also launch a lot more quad-core, quad-threaded Core i3 processors, six-core, six-threaded Core i5 and six-core, twelve-threaded Core i7 models for the desktop market. The lower-end of the market will be served by the dual-core, quad-threaded Pentium Gold line, as well as the entry-level dual-core, dual-threaded Celeron chips. 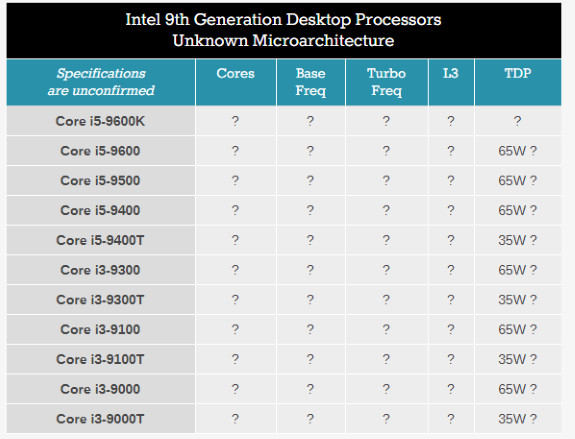 A bunch of names of 9th Gen Core i3 and Core i5 processors also leaked, but it's not certain what these processors are. They could be a refresh of the Coffee Lake platform, or names of future 10nm parts. Full details at AnandTech.